Just in time for Wednesday’s Congressional Baseball Game, Roll Call has launched a fantasy baseball contest for fans to predict their MVPs of the night. Participants will chose nine players from either team – the Democrats or Republicans – and based on those selected and the final score, will be put in the running for prizes including a $200 Nike gift card, two tickets to a Nats game, and a $50 Zappos gift card. 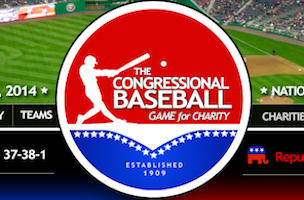 Proceeds from the game go to the Washington Literacy Center, the Boys & Girls Club of Greater Washington, and the Washington Nationals Dream Foundation. Tickets to the game are $10 and can be purchased here. Individuals can register for the fantasy baseball game here. Former professional baseball player Rep. John Tener of Pennsylvania organized the inaugural baseball game in 1909. Republicans won their first game in 1916. The game ran intermittently through 1958, when Speaker Sam Rayburn of Texas ended the game. In 1962, Speaker John McCormack of Massachusetts revived the game in 1962 with the recently launched Capitol Hill newspaper Roll Call. This year marks Roll Call’s 53rd year of play.